Unifor’s four-week strike at the General Motors assembly plant in Ingersoll, Ont., cost the automaker production of 20,000 Chevrolet Equinox crossovers — and money — GM’s CFO revealed in a third-quarter earnings call Tuesday. 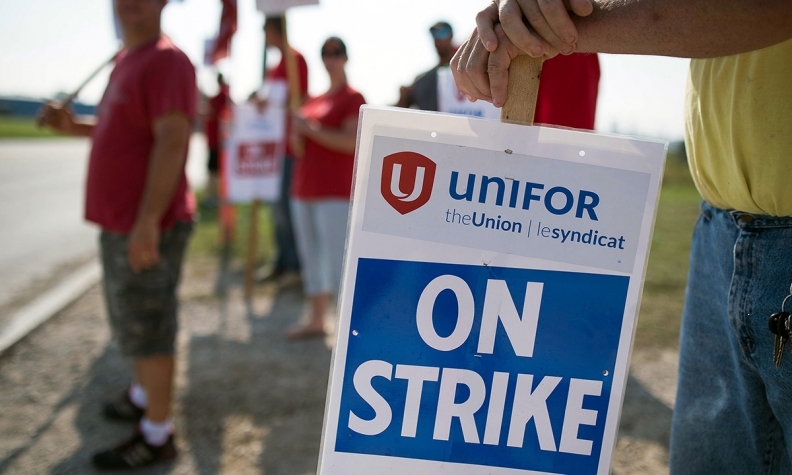 “At the end of the day, we lost 20,000 units in the strike that we had in Canada, which won't be made up and that has an impact on working capital and the timing,” Chuck Stevens said on the call. Despite the strike, Stevens said the automaker is expected to generate around US$6 billion in adjusted automotive free cash flow, but that’s down from the expected US$7 billion. The company also aims at returning capital of up to US$7 billion to its shareholders in 2017. About 2,500 Unifor members walked off the job Sept. 17 and struck the automaker for about a month. Unifor had demanded during negotiations that the plant be named the lead producer of the hot-selling, redesigned Equinox. That meant if GM needed more of the compact crossover, CAMI would be first to get the work, but if sales slowed, production would be scaled back first at a pair of plants in Mexico. But the new deal, ratified Oct. 16, does not include such wording. The contract also lacks promises of new product or new jobs. Instead, there is what the union considers stronger language surrounding job security. The union said that the contract makes it more costly for GM Canada to close the plant -- about C$290 million vs. C$190 million in the previous contract. U.S. sales of the Equinox surged 80 per cent last month to 27,512 compared to last year, and deliveries total 212,735 through September, up 22 per cent. While its total vehicle sales continued to soar in Canada during the third quarter, charges related to General Motors' sale of its European operations dragged the company down to a US$3 billion third-quarter net loss, while profits from its continuing operations also declined sharply due to cuts in vehicle production. GM on Tuesday said its adjusted pretax operating profit -- the number that GM says best represents its underlying financial performance and a key focus for investors -- declined 31 per cent to US$2.5 billion in the third quarter.